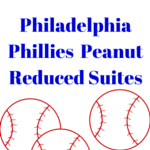 Just spotted--the Phillies have announced there will be peanut reduced suites for two games this season. Peanuts will not be allowed in the two suites--All Star Suite 10 and MVP Suite 11 for the April 16 and May 20 two games. Tickets are $60, and include food and non-alcoholic beverages. For additional information, please visit the Phillies website or contact Jen Leone in the Phillies Group Sales Office at 215-218-5267 or jleone@phillies.com.